There’s something uniquely fascinating about visiting a country in a time of flux. Ideally you should do this once the smoke has dispersed and the threat of violence is no more than a quiet rumble in recent memory. Yet you want to go there before the new regime is fully established, when people understand their new role, but have yet to fully embrace it. 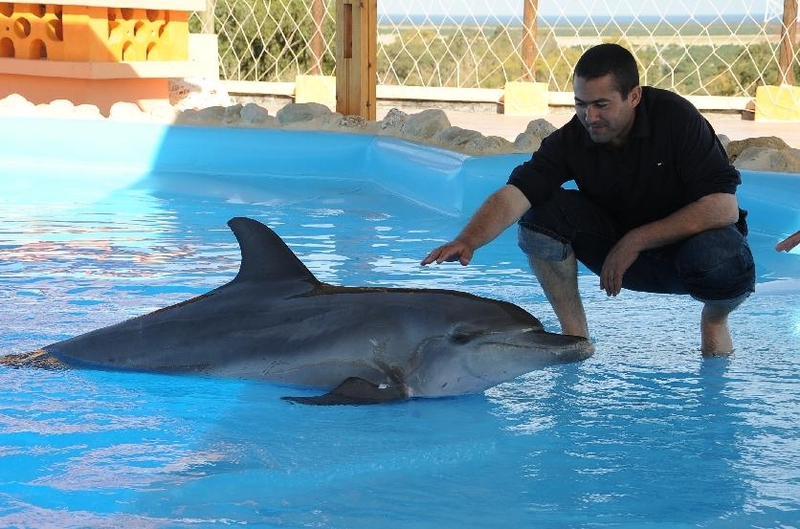 That was the timing I hit on when I visited Hammamet in Tunisia. Just six months since the revolution was unleashed with a single, desperate self-immolation, and five months since President Zine al-Abidine Ben Ali finally took the hint and departed, the country was still revelling in its new-found freedom yet, for most, there was still a feeling of uncertainty. Tourism has been the golden ticket here since Romans stumbled across the glory of its natural springs, leading to them naming it after the Roman word for baths, Hammam. In more recent times fans have included Angelina Jolie, Antonio Banderas, and, ironically, Zine al-Abidine Ben Ali, the very man whose corrupt activities have led to holidaymakers turning away from the country. 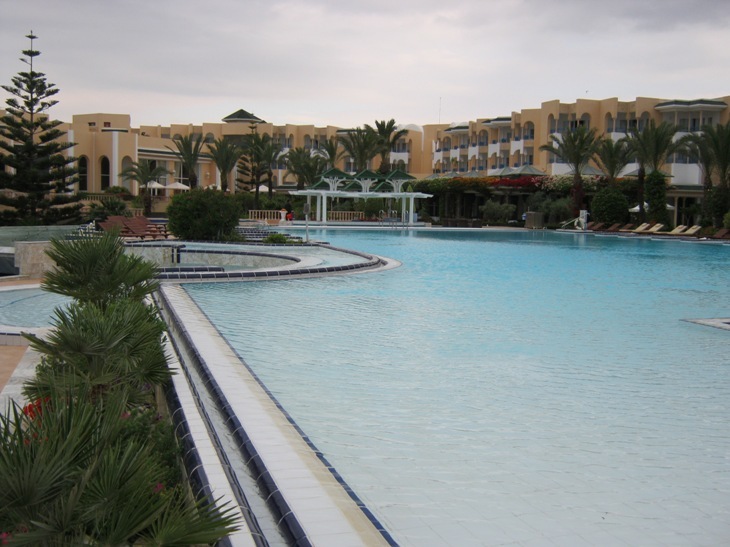 Since Roman times an abundance of five-star hotels have appeared along the resort’s gleaming beaches, and one of the finest is undoubtedly the Hasdrubal Thalassa & Spa Hammamet, where I was lucky enough to stay. This palace of a hotel boasts the world’s biggest presidential suite, complete with private indoor and outdoor pools for the likes of Mariah Carey and her entourage to wallow in. Even the Junior suites, the hotel’s most modest accommodation, offer more floor space than some flats I’ve lived in. The staff are vigilant about ensuring every surface remains liberally sprinkled with rose petals, so that every night you have to scoop handfuls of the things off your pillow, shake them from your flannel and try not to panic when you discover the toilet bowl swimming with them. 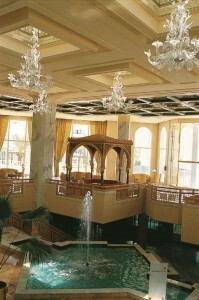 It would be easy enough to spend your days entirely in the hotel grounds, enjoying the pools, spa facilities and stretch of private, secluded beach, head to the hotel art gallery or unwind in the bar with a shisha pipe. But there is also plenty to visit nearby. In busier times, a small trolley kitted out as a tourist train transports visitors and depositing them at Central Hammamet. On sunny days this must be a glorious journey, culminating in views over the glittering sands cradling Hammamet Bay. The day I visited was stormier than the locals are used to, with a brisk wind that sculpted the waves into ever more dramatic shapes. 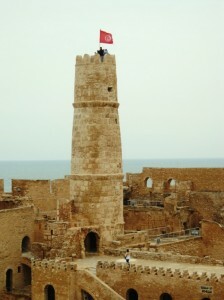 The Hammamet fort was built to defend the coastline between Egypt and Morocco from invading Turks and Sicilians. The sandstone walls and towers glow golden in the sunlight and offer views across the Mediterranean sea towards the Atlas Mountains. I was intrigued to see countless names carved into the soft stones – a modern means of leaving your mark on a physical piece of history. 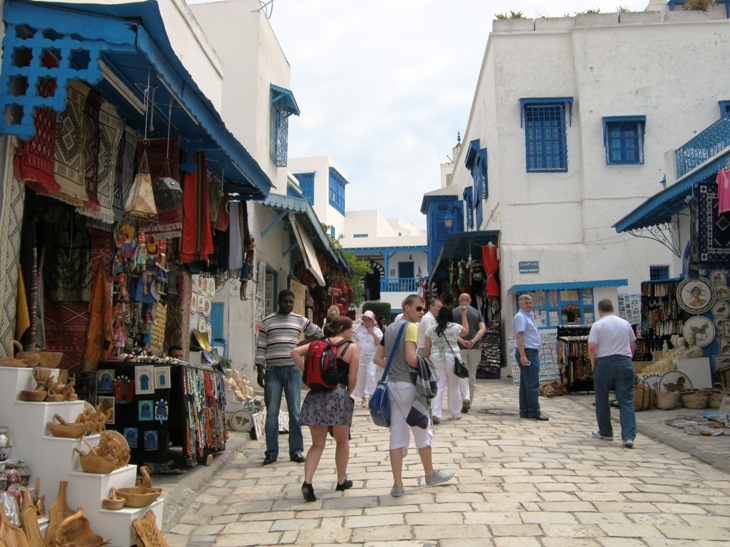 The Tunisians seem to embrace this mix of ancient and contemporary life, casting aside reverence in favour of practicalities that have helped them survive the last few challenging months. There’s a café set into the fort where you can sit and absorb your surroundings while sipping a fragrant mint tea, overlooking the courtyard where pine trees grow heavy with the edible kernels that are made into creamy desserts for special occasions such as the anniversaries of Muslim Prophets’ births. 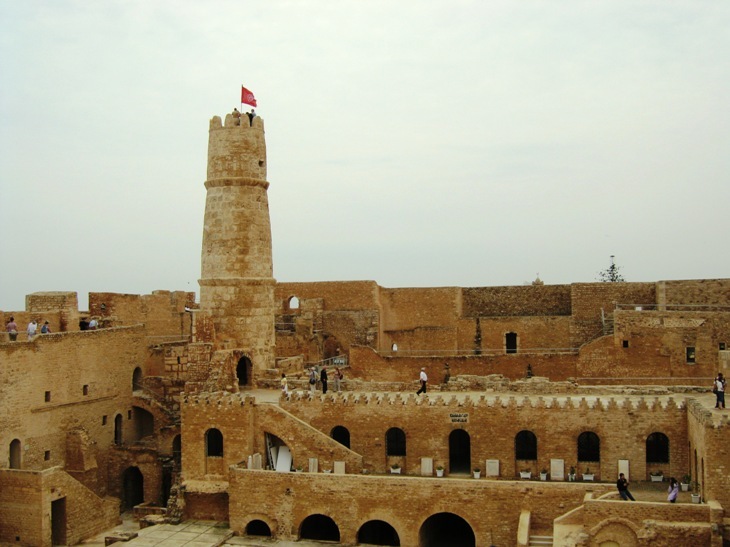 This casual blending of old and new, sacred and everyday, is also evident in an other ancient forts I visited, the Ribat of Harthema at Monastir, where the intriguing corridors have served as backdrops for Monty Python’s The Life of Brian and Italian film Jesus of Nazareth. In some shadowy corners, bicycles lean against the ancient walls, while house martins wheel overhead building nests at the fort’s highest points. Much of this area of Tunisia reminded me of rural Spain, but there are distinct giveaways that this is not Europe. The eloquently curling script adorning signs and shop fronts, for example, and the fact camels roam the countryside as commonly as the sheep and cows, a clue that agriculture was once the key industry here. The region’s long love affair with tourism certainly has its benefits, though, and if you venture over there before the world’s holidaymakers remember what they love about the former French colony, you’ll have your pick of the attractions. 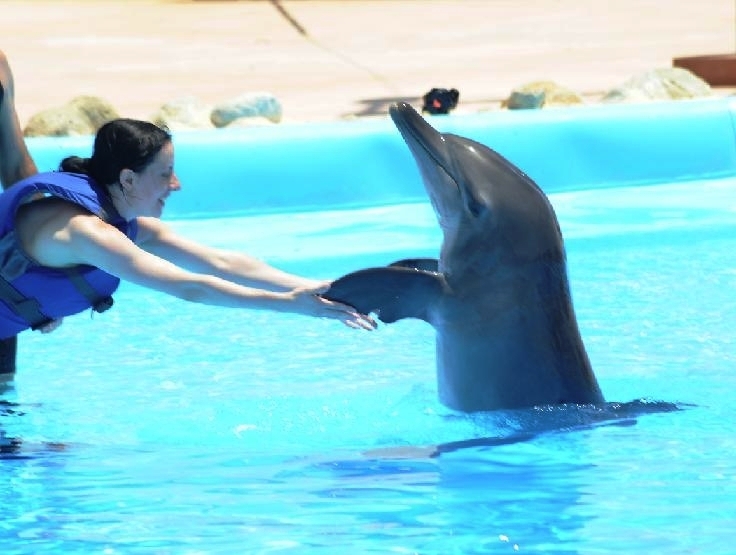 The dolphin show at Friguia Park is particularly popular, and travel company Tunisia First will pick you up from your hotel, take you to the park and let you take a 30-minute swim with the graceful cetaceans from around £139 – certainly something to write home about. 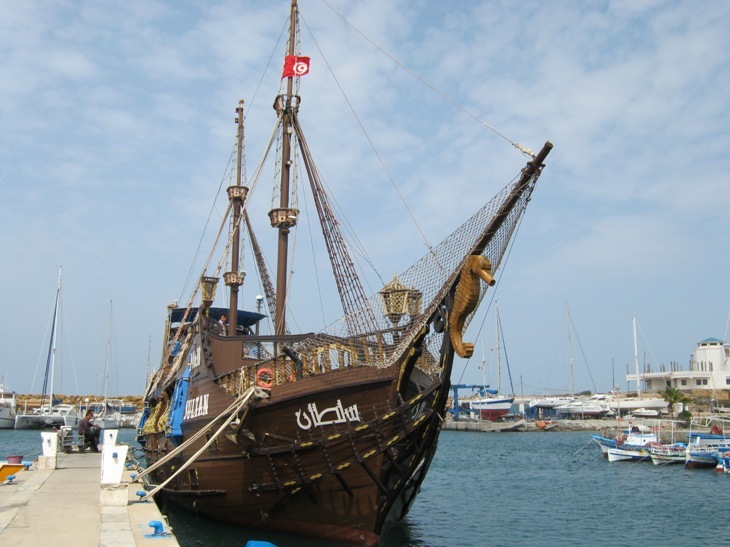 Along many of the quays you can board pseudo pirate ships for pleasure cruises and golf courses such as Golf Citrus, to ensure you’re spoilt for choice at tee time. There are also plenty of excellent restaurants offering superb cuisine that blends African spice, Mediterranean freshness and French finesse to spectacular effect. For harbour views while you dine, Restaurant Le Mediterranée at Port El Kantaoui or Restaurant Le Grill at Marina Cap Monastir can’t be beaten. On my last night in Tunisia, I was treated to a feast at Restaurant Scheherazade, where belly dancers kept me distracted from my mezze for most of the evening. While traditional music played, the women writhed, undulated and wriggled with all the exotic mystique of the Arabian Nights tales. A touch tacky? Perhaps, but as one of the few tourists in Tunisia at this time, I was happy to soak up every shimmy. 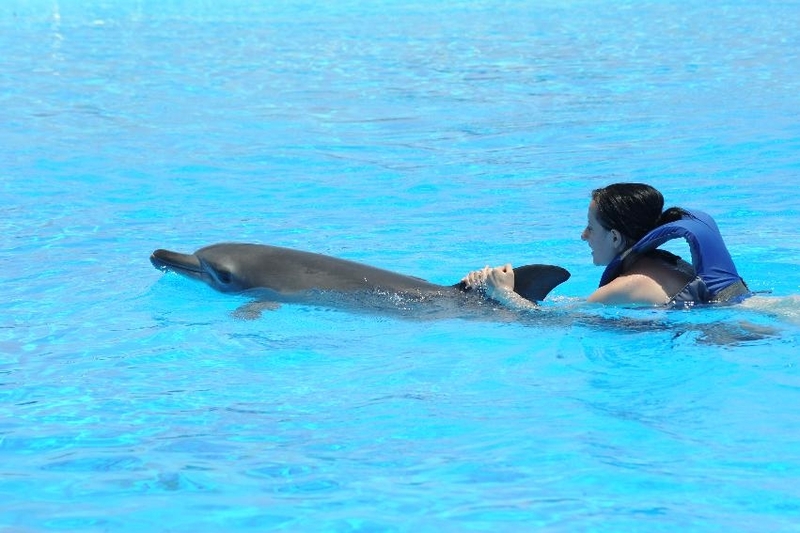 How about Swimming With Dolphins ? Finally, find out more about your author, Judy Darley.